Nanobiotechnology is the assembling of biological molecules into nanodimension structures, membranes with nanodimension thickness or nanotubules with nanodimension diameter. 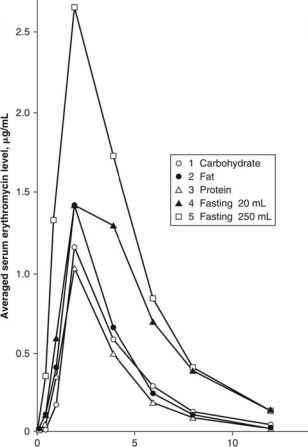 The first nanobiotechnology approach reported is the crosslinking of hemoglobin into ultrathin polyhemoglobin (PolyHb) membrane with nanodimension thickness (Chang, 1964, 1965) (Fig. 2.2). This is used to form the membrane of artificial red blood cells (Chang, 1964, 1965). If the emulsion is made very small, then the whole submicron artificial cells can be crosslinked into PolyHb of nanodimension. 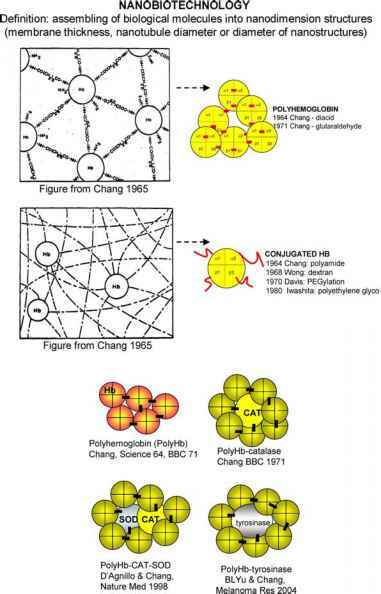 Glutaraldehyde can crosslink hemoglobin to form soluble nanodimension PolyHb, each consisting of an assembly of 4-5 hemoglobin molecules (Chang, 1971b) (Fig. 2.2). Fig. 2.2. Nano artificial cells can be prepared in nanodimensions as membrane-enclosed nano artificial cells or by the use of nanobiotechnology to assemble biological molecules together into nanodimension structures. Upper: An example of assembling of biological molecules to form polyHb and conjugated Hb. Lower: Examples of different types of nanobiotechnology-based polyHb-enzymes. waiting for typing and crossmatching in the hospital. They are also free from infective agents such as HIV, hepatitis C, bacteria, parasites and so on. Furthermore, whereas donor blood has to be stored at 4°C and is only good for 42 days, PolyHb can be stored at room temperature for more than a year. Thus, PolyHb can have important uses in a number of clinical conditions notably for surgery.